On site cabins have views or decks overlooking the water. We feature "down-home" family style cooking. Spring has sprung in the Shenandoah Valley! Come see the spring flowers and redbuds in bloom! Owners, Bob and Cece Castle have remodeled this Luray, Virginia 1940’s motel into a collection of log-look cabins with comfortable Williamsburg-style furnishings throughout. And, for more than eighty years, Brookside has been welcoming guests from around the world. We are a hospitality institution in Luray, Shenandoah Valley, Virginia, USA. These Luray Virginia vacation rental cabins are the closest accommodations to the Shenandoah National Park’s Central District. Located along U.S. 211 East, near the entrance to the park. The rear of the cabins open to decks or sun rooms which overlook a scenic bubbling brook. Brookside Cabins and Gift Shop are open all year. Now is a great time to get away and spend time in the Shenandoah Valley. You can enjoy the Caverns, Shenandoah National Park and do some shopping in our gift shop. Five “honeymoon” units have whirlpool tubs or hot tubs. Six of the rental cabins have gas fireplaces, and one has a kitchen (the others, refrigerators and coffee makers only). In order to preserve the natural setting, none of the cabins have a TV or phone. We also have 3 units available located two miles from the cabins and restaurant offering TV. If you are looking for a place to hold your meeting, event, holiday party, or need catering at your site, give us a call and we can provide just what you need. The Brookside Rental Cabins in Luray, Virginia are a quiet, elegant, and a total retreat from today’s hectic life. At Brookside, we focus on great food and comfortable living at a great price in a family environment. We hope you will plan to visit and stay at Brookside soon. 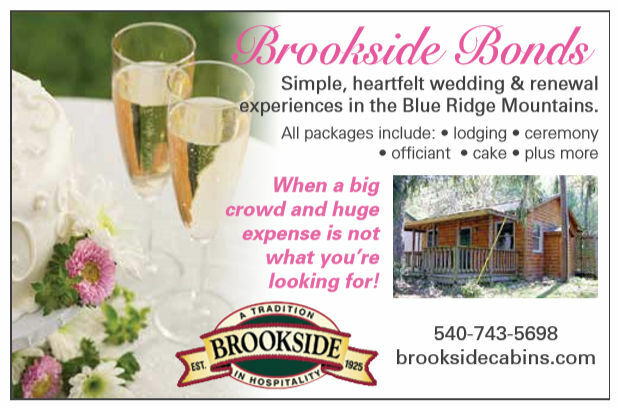 © Copyright 2014-2019 Brookside Cabins, Restaurant & Gift Shop - Luray, Virginia - All Rights Reserved.